Easter Rising Commemoration in Castlebar. 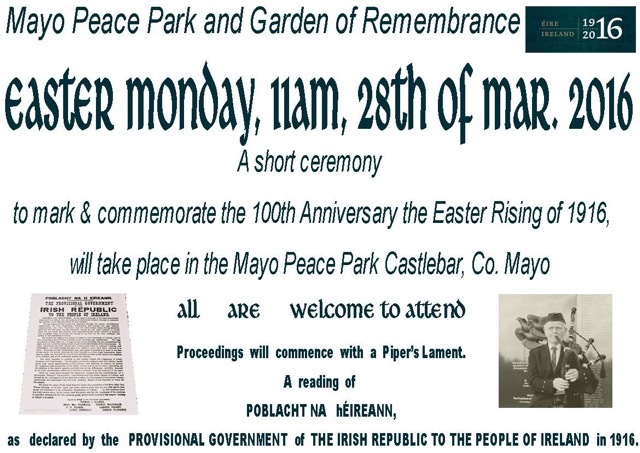 A ceremony to mark and commemorate the 100th Anniversary of the Easter Rising of 1916, will be held in the Mayo Peace Park, Castlebar, at 11am on Easter Monday morning the 28th of March 2016. Community Choir & Men Shed Members . "Local Mayo People"
The Saulia / Achill School Band. Subject to confirmation. POBLACHT NA hÉIREANN, as declared by the PROVISIONAL GOVERNMENT of THE IRISH REPUBLIC TO THE PEOPLE OF IRELAND in 1916.